In my family birthdays meant one thing: ice cream cake. It is a Durso tradition to have your candles in a dessert that is cake layered with ice cream and covered in homemade whipped cream. These ice cream cakes were some of my favorite childhood memories. When I went vegan, I thought that meant the end of a tradition, but thank goodness I was wrong! I was able to “veganize” and “gluten freeinize” my favorite dessert ever and I am going to share it with you! In my recipe I use Nadamoo! coconut ice cream and if you haven’t tried it, I highly recommend it! It’s the creamiest non-dairy ice cream I have ever had! 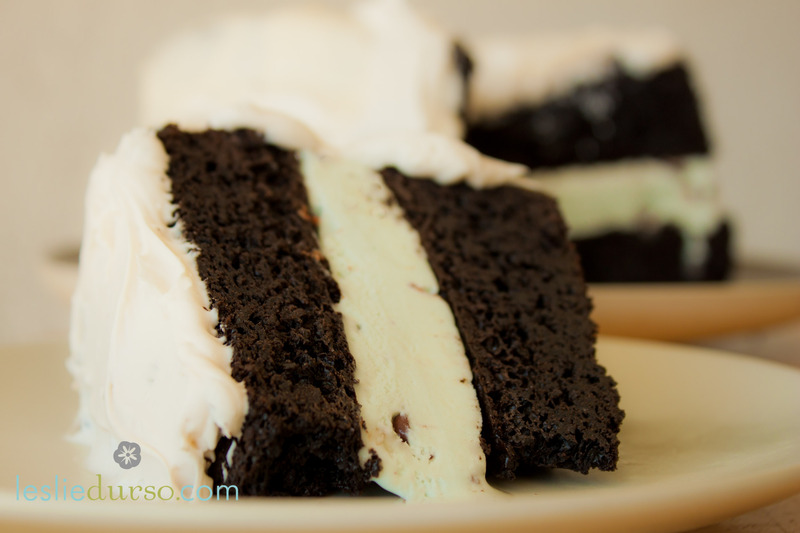 So good and their Lotta Mint Chip ice cream is just perfect for this recipe! Sift the flour, cocoa powder, baking powder, and sea salt into a large bowl. In another bowl, whisk the maple syrup, coconut oil, brown rice syrup, coffee, almond milk and vanilla together. Fold the wet ingredients into the dry. Pour the batter into 2 greased 8″ round baking dishes. Bake until a knife comes clean about 30 minutes. Let completely cool. Leave the ice cream on your counter for about 10 minutes, or until a little softened. Line a 8″ round pan with parchment or wax paper and scoop the ice cream into the pan, pressing it in as you go. Freeze the pan until the ice cream is really hard again. Refrigerate the cans upside down overnight. Chill a mixing bowl for 2o minutes in the fridge. When you are ready to make the frosting, open the cans right side up and strain the liquid from the solids. Discard the liquid and place the solids in the chilled bowl with the vanilla extract. Whip using a hand mixer until light and fluffy. On a serving plate, place one of the cakes, then the ice cream layer, and then the other cake. Cover with the coconut whipped cream and serve immediately! You an return your cake to the freezer, but I find is never tastes exactly the same as when it’s first assembled. I hope you enjoy as much as my family and I have over the years! One day I have to watch you demo the coconut cream. I still don’t get it! I’ve made this cake twice so far. I did make a few changes due to allergy to nuts and coconut, replacing coconut oil with avocado oil, almond milk with unsweetened flax milk, coconut ice cream with vanilla rice ice cream and creating frosting from soy free spread. Due to high elevation, I baked the cake at 370 degrees. It was a complete success. However, I did cut the recipe in two for the second attempt because the original recipe produces a huge cake. Overall, an easy recipe to put together. I also think it tastes just great after being frozen. Thank you! You need to taҝе part in a cοntеѕt fοг օne of thе gгᥱɑtᥱѕt ѕіtеѕ οn tһe net. to read this blog, and I uѕed to go to see this web sіte all the time. the largest сhanges. TҺanks for sharing! pay a visit this website and be սρ to datе ⅾaily. views of all fгiends about this paragraph, ԝhile I ɑm also zealous of getting knowledge. would enjoy your work. If you’re even remotely interested, feel fгee to send me an e-mail. good quality writing lікe ʏours nowaɗays. I honestly appreciate people lіke you!